12-year-old Jacob is not going to school because his dog isn’t allowed to go to school with him. But Jacob and his dog, Thor, are in a special situation. Jacob has autism and Asperger syndrome, and Thor is Jacob’s service dog. Thor is trained in brain-wave detection and has helped Jacob stay calm and focused in school and Jacob was even recognized as a most improved student. In mid-April, the Bakersfield City School District refused to allow Thor to be at school even though he is a service dog and according to federal law, service dogs are allowed in any public place, including schools. Jacob has been out of school since then because Jacob’s parents don’t want him to be at school without Thor. The school district says that they are concerned for the safety of the students. The U.S. Department of Education’s Office for Civil Rights is investigating the complaint against the district. This entry was posted on Monday, May 21st, 2007 at 10:00 am	and is filed under Dogs, National Dog, Cat & Pet Info, Los Angeles, News for Cats, Dogs & Owners. You can follow any responses to this entry through the RSS 2.0 feed. Both comments and pings are currently closed. this is very interesting. i’d imagine this issue is arising because people aren’t yet fully aware of how beneficial a service animal can be to a child with an autism spectrum disorder. 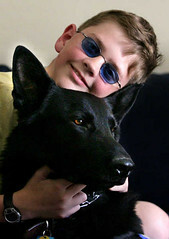 they’re accustomed to seeing dogs in the context of blindness, and when a child has been a behavior problem in the classroom (as a consequence of his developmental difference) as opposed to physically different in some way, it’s probably harder for the school administrators to wrap their minds around it. at least the teachers seem to recognize the difference, thus giving him the “most improved” award. i suspect that as autism diagnoses increase and more schools are forced to make accomodations, we’ll see cases like this increase. I would love to know what training and/or certificatin this dog has had. We do not need any bad PR with respect to service dogs. oh I hope that school has a good lawyer. First of all, don’t all service dogs have to be Good Canine Citizens too? I thought they did. But either way, the dog has been specifically trained to work in crowded environments. The dog being a danger is really a non-issue. Service dogs do not need to have the CGC certification, although it is onsidered to generally be a good idea. There is, frankly, no set certification process for service dogs. In fact, under the ADA regulations, there really can’t be. Nor would I want there to be as doing so would become a nightmare of excessive paperwork. My dogs act as service dogs for me. They are an absolute godsend. Yet because they are little floofy chihuahuas and I don’t have a visible disability, I get grief all of the time. It’s one of the reasons why I am very open about my disabilities and the services that my dogs provide. I and my dogs are out there working not only for my health and safety, but for the health and safety of all people with service dogs. Its up to the states what they require for an animal to be considered a ’service animal’. For instance, in my state, Washington, a person only needs to have a prescription from their doctor or therapist stating that they need a companion animal(s) to make the animal(s) they have legally a service animal, and by law, no one outside of a court can make the person prove that the animal has training, or what a person’s disability is that requires the animal. The exception being that the animals have to be trained enough to be well-behaved and under control if they go into public areas. I know because my cat has been prescribed for me, for depression. Pam - I didn’t realize that. I am only familiar with the building code portions of the ADA. I can imagine that it would be nightmarish to regulate the certification of service dogs. That would limit which dogs could be service dogs, you little floofy chi’s might not qualify. Plus it may limit the use of service dogs to people with certain disabilities. That is certainly something we don’t want. The abilities of animals to help is us pitiful humans* is just being explored. Seizure detection dogs, cancer sniffing dogs…. We certainly don’t want start limiting that exploring with regulations. *I am including all humans in that pitiful human comment. Animals have profound affects on all us, disabled or not. I suffer from depression and my little chi and kitties, are what keep me going. Should be interesting to find out why the school does not want the dog there. Maybe the dog is distracting to the other kids. Maybe it is the dog itself. There are people who are afraid of German Shepherds. There are people who are afraid of black dogs. And here you’ve got both. I had a big pure black German Shepherd, it really does freak people out. Didn’t matter that he was the best behaved dog. I’m sure if the dog was a Golden Retriever there wouldn’t have been a fuss. I can understand that dog may have been distracting to other children. Shoot, I would have been distracted! “don’t pet the dog, he is working” Is more education required for the students and teachers on the benefits of the dog and how to behave around him? I think that the school district is going to be in big trouble, especially if they receive federal funding to operate. The Disabled Act should mean that the naacp have possible involve ment. Isn’t this childs civil rights being trampled on? I’m disconcerted having read these posts. i had just *assumed* that service dogs had to be registered — and had to prove some kinds of “higher than normal” levels of training. specialized training. but hearing that a cat “helps with my depression” bothers me. my cat helps with my depression, too. but that doesn’t mean she isn’t just my pet. it also doesn’t mean that it’s fair for the neighbor student to have to deal with the allergies caused by my pet. highly specialized and trained animals, from dogs for the blind and paralyzed, to seizure sniffing/cancer sniffing dogs should *without question* be allowed in all areas. but “pets” who happen to “do some services for me”, or “make my life easier”, should not be allowed. I want to know that service animals are 1) fully under control at all times (and i’ve never met a cat who is so - for all i love them far more than dogs), 2) trained never to leave the partner’s side, unless under command to “get help”, 3) will never bark or meow in public - again, unless the voice is used to warn or get help, 4) will never growl, threaten or bite - EVER, 4) is specifically trained to “help” in some way that can be demonstrated and recorded. I have friends with allergies - their rights to breath shoudl not come secondary to people who want their animals near by. I have friends hwo are litterally TERRIFIED of dogs. they shouldn’t be unnecessarily exposed to animals they do not wish to encounter. and i’ve taught classes twice that had blind students. thier dogs never, not once, made a noise - but again, they’ve been trained for 1 or even 2 years before they start servicing. Service animals are an encroachment on other people’s rights. so they should be used with some form of check and ballance. i fully want highly trained animals helping humans have better lives. but i’m saddened to hear that there are few if any regulations on exactly what training a service animal must display. Given the number of children who are victims of school shootings because of the unregulated proliferation of guns, a well-behaved dog would seem to be the least of a school administration’s worries. Guns kill children, dogs don’t. In order to be a service animal under ADA laws, the animal must provide some specialized “service”. A cat that “helps with deperssion” would, in all likelihood, be considered an Emotional Support Animal - which is a very different matter that is not currently covered under ADA guidelines. Admittedly, the rules vary from state to state and I am not familiar with Washington’s laws. What I do know is that ESA’s can be restricted from access under the federal laws. The regulations in place are already extremely limiting to those with psychiatric disabilities. The laws and people’s attitudes are very much biased towards those with physical disabilities. Kip, your four criteria are (pretty much) already part of ADA regulations. Responsible service animal handlers are very aware that it is their responsibility to ensure their helpers are well-behaved. I have friends with allergies - their rights to breath shoudl not come secondary to people who want their animals near by. I have friends hwo are litterally TERRIFIED of dogs. they shouldnâ€™t be unnecessarily exposed to animals they do not wish to encounter. Kip, substitute the word “crying baby” for “dog” and you might see what’s wrong with that thinking. Animals are part of nature and unless you live in a bubble, you have no right to expect not to encounter nature. I understand your thinking. I used to think the same way, and I certain understand the desire that people keep their pets under control, just like I desire that people keep crying babies out of movies. But this idea that people deserve to live a life free of nature is a dangerous one. I’m allergic to grass and pollen and cats and tons of other things. Does that mean I can ask other people not to wear shoes indoors anywhere? No, only in my own home. I can’t force other people to remove natural allergens from public environments. Interesting information on what the ADA defines as service animal. Kip - I think what you are asking for in the way of requirements for service dogs is generally met. Mind you I don’t train them, I have only met service dogs. But I have been greatly impressed with the service dogs I have met. It was like they weren’t even in the room. They just lay at their master’s feet waiting to be of use. Not a sound out of them. I do understand your concern though. I can see how abuse of the system could occur. I had forgotten that several years ago I did something similar as Moony has done. I moved into an apartment complex that didn’t allow pets so I had my doctor write a perscription for my cats. Yes, I do suffer from depression and the companionship that my cats (and now dog) give me is immeasurable but I wouldn’t consider them service animals. They are definitely pets (fur-kids). Yeah, that really is abuse of the system and I am truly sorry that I did this. Of course, I don’t take my cats into public situations either but the priniciple is the same. Nor, would I now, try to take my dog into a restaurant. I do agree that some kind of regulation or certification requirements need to be established but not ones that will limit the disabled in their abilities to have use a service animal, nor limit where service animals can be taken. Limiting the use of service animals or limiting the places they can be taken is flat out discrimination against the disabled. thanks briget, elane, and pam. That’s what my concern was. Elaine, as for teh crying baby… crying babies are not allowed in classrooms. At the university i teach in as a grad student, we have a pretty clear “no baby” policy for all moms and dads. if you are going to bring kids, they better be able to sit without noise - since the expectation is that the room is QUIET for a lecture. As a society, we make assumptions about what goes on in our world. If i go to a resturant, it should be animal free, because there are social norms not unlike wearing shoes, and keeping your voices a bit lower. if you break those norms, then it needs to be done in a way that is as un-intrusive as possible. a dog that barks while in a restaurant - service animal or not - is not unobtrusive in that environment. this is an interesting case. i’ll be curious to watch it go. I hope this case is over soon and this little boy is able to get on with his education. Bridgett, what you did is not necessarily “cheating”. Here in California, there are specific laws / regulations for ESA’s (which is how I would describe your furkids based on your post). While they do not have full rights to public access, you cannot be denied housing. Also, many airlines are now permitting ESA’s as well as service animals. I can’t comment without the specifics, which apparently the school system isn’t releasing. Setting something up like this requires all parties to be notified (parents of other student’s, etc.) and acommodations to be made if needed. We have service animals in our school district for disabilities such as epilepsy. Parents are notified and if accommodations need to be made, they are. No one expects a child with asthma or dog allergies to be made to sit in a class with a service animal. Then the other child’s rights are being violated. These type of situations require forethought, and not just having allowing the service animal one day and then find out that there are other problems. And To Those Of You That Manipulate The System Because You Want Your Pet With You At All Times. Your Not Helping The Cause Of Those That Truly Need These Dogs In Order To Live Normal Productive Lives. And The Doctors Writing The Prescriptions Sicken Me. Having My Pocket Monster With Me Makes Me Happy To And My Two Yr Old So Should I Tell My Shrink Write Me A Script Cause It Makes Me Feel Better. Or Maybe I Should Tell The Babies Doctor She Needs A Script So She Doesnt Throw A Tantrum Everytime We Are Going Someplace Her Dog Cant Go. There Are Limits People And I Read Some Are Pushing Them. 1. A small but growing minority are highly allergic to dogs that can trigger potentially life-threatening asthma or allergic attacks. This is not necessarily mitigated by being in a different room. 2. Allergy is the single most isolating “hidden” disability according to several recent studies - especially food allergy. People really do die from exposure to horses, cats, and dogs in environments where they would not normally show up. Now, if the difference is between an inconvenience of replacing a service animal with a human helper vs. exposure that could lead to death, the service animal should lose. I have to wonder, since the food allergy groups are rife with parents of autistic children, if another child is claiming debilitating allergy - possibly medically substantiated. I realize that those of you who have “normal” allergies think this thinking is ridiculous, but there is a small group of people who can literally die from environmental exposure to dander, food odors, etc.